The 2003 black comedy Bad Santa earned a cult audience through its unapologetic vulgarity and politically incorrect sense of humour, ranging from Santa fetishists to Billy Bob Thornton swearing at everything and anything that moves. Despite all that, it still had a functioning, if twisted, heart to it that didn’t make it a completely hateful watch. That heart, incidentally, is nowhere to be found in the long-in-development sequel, nor is the wicked charm that helped make it a cult classic in the first place. In its place is a lump of coal that is so black and filthy that no amount of polishing can help make it shine; it is a disgusting disappointment at the bottom of the Christmas stocking, which is already feeling light after the naughty year we’ve all had. The story this time sees miserable criminal Willie Soakes (Thornton, reprising his Golden Globe-nominated role) being recruited by his former partner Marcus (Tony Cox) to travel to Chicago and steal $2 million from a charity. The only problem is that he must work with his foul-mouthed bully of a mother (Kathy Bates), whom he despises with all his black heart, while also dealing with his (unwanted) friendship with Thurman Merman (Brett Kelly), the young kid from the first film. It’s basically the same film as before, only if it sucked. 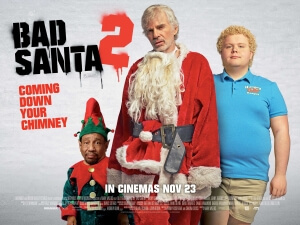 Bad Santa 2’s long stint in development hell really shows in the final product, as it lacks a credible reason for actually existing other than the first one became such a cult classic, not to mention that it’s thirteen years too late for a sequel to even be relevant anymore. Like a lot of bad comedy sequels that come years after the success of the first one – including, but not limited to, Zoolander 2, Son of the Mask, Caddyshack 2 and so on – this one tends to repeat a lot of the same jokes, deliveries, and sometime even plot points of its much fresher original, but without any of the same levels of wit, sophistication or shock values of what came before it. There are a lot of jokes at the expense of Cox and his status as a little person, though perhaps not to the level of Mike Myers’ treatment of Verne Troyer in his movies, but unlike last time the writing is so poor that there is no underlying notion of character in these insults and they just feel mean-spirited for the sake of being mean-spirited. However, this is the kind of film that hates everyone, and not just little people; it hates women, who all seem to be either double-crossing scum or interested solely in being ploughed in a grimy alleyway or bar toilet; it hates children, represented by Kelly’s bizarre reprisal of the role he played when he was under 10, only his wide-eyed ignorance and simpleton personality comes across a lot creepier now that he is a 21-year-old man; and it also hates the people who are watching it, as it gives them a relentlessly miserable viewing experience for not just fans of the original, but also audience members in general who want a raunchier alternative to the usual Christmas formula but are instead forced to watch this awkwardly-director, poorly written dreck. The only person who this film doesn’t seem to hate is, funnily enough, Thornton himself, who slips back into his most popular role with suspicious ease and does what he can to make the lacking material work in his favour, and to his credit if there’s anyone who can nail the drunken nastiness of this character, it’s Billy Bob Thornton. But even he can’t save yet another comedy sequel that years too late, has almost none of the same people involved in its making, and can’t hold a candle to its predecessor’s legacy no matter how hard it may try. In a year that’s already been exceptionally tough on sequels (ones like Alice Through The Looking Glass and Independence Day: Resurgence bombed with critics and audiences, and even the good ones like Star Trek Beyond and Kung Fu Panda 3 didn’t exactly light up the box office either), the fact that Bad Santa 2 is just as rotten as a lumpy and mouldy potato in your Christmas stocking, right next to that filthy piece of coal, certainly doesn’t help matters. Bad Santa 2 retains none of the filthy wit, vulgar charm, or twisted heart of the original cult classic, and is instead a soulless and hateful retread that has no purpose in even existing outside of its predecessor’s cult status, offending everyone in the process without restraint or a sense of enjoyability to it.